﻿ José Sandoval: "Cristiano Ronaldo can score 50 goals in a season"
24.09.2011 » José Sandoval: "Cristiano Ronaldo can score 50 goals in a season"
Rayo Vallecano coach, José Sandoval, has been carefully preparing the match against Real Madrid over the last days. Sandoval identified Cristiano Ronaldo as Madrid's biggest menace, since the Portuguese can score more than 50 goals in a single season. José Sandoval is Rayo Vallecano's coach, which will be Real Madrid's next opponent for La Liga, this Saturday. Sandoval previewed the game and had no problems in pointing Cristiano Ronaldo as Real Madrid's biggest threat. The coach says that any player who is able to score more than 50 goals in a season, should necessarily be respected and feared by any opponent. 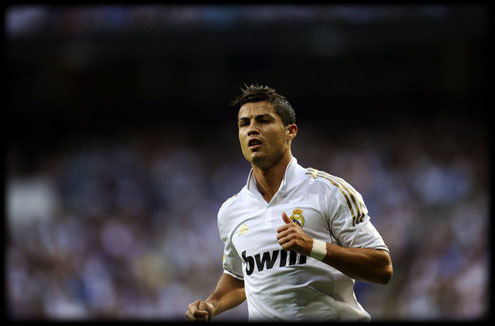 Ronaldo scored 53 goals in 2010-2011. Sandoval: "Real Madrid has a tremendously good team, but it's obvious that a player who can score up to 50 goals in a single season, is not one of the bottle. ", said Rayo Vallecano's coach, when reffering to Cristiano Ronaldo. However, Sandoval was keen to note that Real Madrid isn't a one-man team and his team will also be concerned in defending and not giving spaces to the other players. José Sandoval: "There are other players which we should be very careful with. One that also worries me a lot is Angel Di María, because he's a football player who manages to excel himself. The biggest challenge and difficulty when facing a team such as Real Madrid, is not to block their players individually, but rather overcome their collective organization. In my opinion, for us to pick the 3 points from the Santiago Bernabéu, Real Madrid will have to be in a very bad day and us to have a truly great performance." Real Madrid will play today against Rayo Vallecano, in a La Liga fixture. You can watch Juventus live stream, Real Madrid vs Rayo Vallecano live, inside our Live Games Streams section. Cristiano Ronaldo will be in the line-up. The countdown clock timer, displaying the time left for the next Ronaldo game, is shown on the top right corner of all pages. Remember that this Saturday, besides the Real Madrid game, you'll also be able to watch Stoke City vs Manchester United live stream and watch Barcelona vs Atletico Madrid live, in our "Live" section.